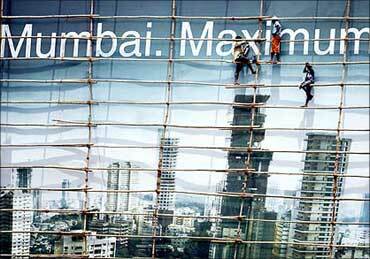 Rediff.com » Business » Mumbai's Nariman Point bounces back! 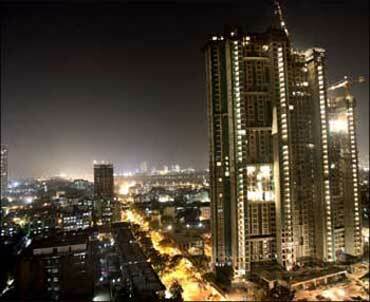 Mumbai's Nariman Point bounces back! After years of playing second fiddle to newer areas such as Bandra Kurla Complex and Andheri in Mumbai, Nariman Point, once the most coveted address in Mumbai and the country's first central business district (CBD), is bouncing back with a vengeance. According to estimates made by property consultant Jones Lang LaSalle Meghraj, at least seven lease deals for 45,000 sq ft (BKC saw deals for 50,000 sq ft in the same period) have been struck in buildings such as Hoechst House, Nirmal, Nariman Bhawan and Express Towers in the last six months. That's 50 per cent more than the previous six months. Several other deals are in various stages of negotiations. Of this, Express Towers, which has a total built-up area of 400,000 sq ft, has seen four lease renewals by high-profile tenants such as Bank of America and Temasek. Others like Hoechst, One Forbes House and so on report similar renewal rates. The business district saw few property deals in 2008 owing to the economic meltdown and companies and financial institutions shifting to Mumbai suburbs such as BKC, Andheri and others. All that is history. With fast moving consumer goods giant Hindustan Unilever refurbishing its iconic Backbay Reclamation office with a space of 150,000 sq ft and deciding to rent it out, prospective tenants have already queued up. The company is expected to earn Rs 60 crore (Rs 600 million) to Rs 70 crore (Rs 700 million) annually from leasing the space. "Large legal firms and private equity investors have also started looking at south Mumbai to set up their offices. For those who are looking at investing in India, it is the first preference," says Raja Seetharaman, national head, agency leasing, JLLM. One of the major problems Nariman Point faced earlier was sky-high rentals and the poor quality of buildings -- there was an acute shortage of Grade A properties that companies want. That problem is being rectified with several iconic buildings being refurbished and attracting tenants like never before. The supply of A Grade office space has increased to 2.5 million sq ft against 1.75 million at BKC. The main lobby of Hoechst House easily gives the impression of the headquarters of the kind of large multinational one sees in Hollywood films with designer marble flooring and clocks showing the time from around the world. The building houses tenants such as Caylon Bank, Commonwealth Bank of Australia among others. Other buildings have put up large LCD televisions, heritage mural designs with a blend of contemporary designs and metallic-finish elevators. Some of the buildings have also put up digital video recorder/network video recorder-based CCTV systems and automatic boundaries on vehicular entries. All the floors have also been given a makeover. 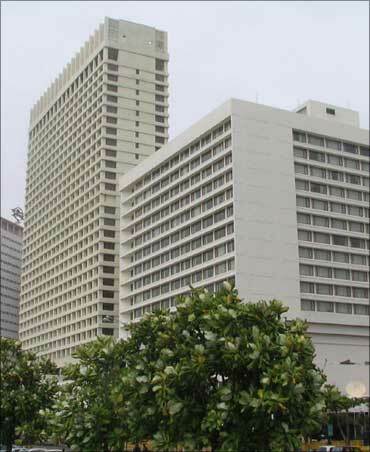 Those who have leased space at Nariman Point vouch for south Mumbai's charm. "It is closer to both CST and Churchgate train stations which makes it convenient for our employees to travel. Even our sponsors (Axis Bank) is nearby," says Rajiv Anand, managing director and chief executive of Axis Mutual Fund, whose firm has leased 10,000 square feet of space in Nariman Bhavan in Nariman Point. Though rents have softened in south Mumbai, as they have in other parts of the city, the refurbished buildings today command 20 to 30 per cent higher rentals than before, consultants say. 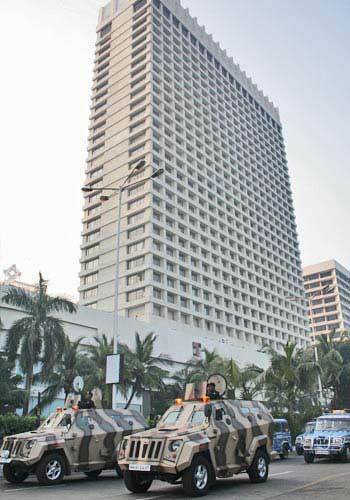 For instance, Commonwealth Bank of Australia leased 7,444 sq ft of space at Hoechst House a couple of months ago at Rs 330 a sq ft per month compared to Rs 275 a sq ft in early 2009. Most of the A-Grade buildings in the area now command a rent of Rs 225 to Rs 350 a sq ft depending on the address you choose. Seetharaman of JLLM says property owners are targeting global companies that have different offices in various parts of the city and are planning to consolidate in one building. Though nobody can afford Nariman Point for their back offices, it is becoming the preferred choice for the front office, he says. 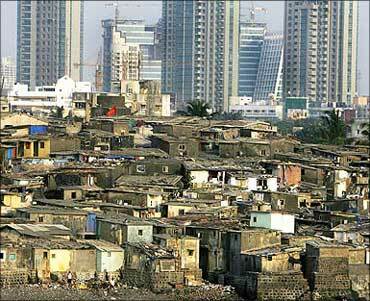 Firms such as HSBC, Royal Bank of Scotland, Deutsche Bank have set up their back offices in various parts of Mumbai. Ambar Maheshwari, director of investments at international property consultant DTZ, says single- or dual-ownership structures like Express Towers, part owned by ICICI Venture and Indian Express group, is making all the difference in south Mumbai. Most of the buildings in the area are strata-owned, where different people own parts of a single building. But some say Nariman Point can't be immune to the general oversupply of commercial space in Mumbai. If some Grade A buildings are commanding higher rents, there are others that still have empty floors today on account of lower demand, says the chief executive of investment bank who has an office in south Mumbai. According to DTZ estimates, Mumbai is likely to add 15.3 million sq ft of office space by the fourth quarter of 2010 against the projected absorption of 5.5 million sq ft.
All the same, vacancy levels at Nariman Point have dropped to 9 to 10 per cent; comparable figure at BKC is 25 to 30 per cent.